Besides being an essential item to serious aspiring producers and musicians, it’s no secret that business cards can leave a powerful impression on new contacts. 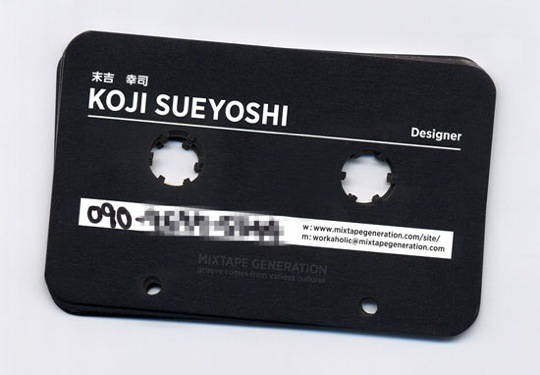 Designer Koji Sueyoshi’s cassette shaped business cards and accompanying cassette case are certainly unforgettable and sure to catch an extra glance from anybody who receives one. Why in the world didn’t I think of this??? I have a radio play homepage and need this card. Please help. Thank you so much. Thanks for itnrdociung a little rationality into this debate. Thanks for another fantastic article. Where else could anybody get that kind of information in such a perfect way of writing? I have a presentation next week, and I am on the look for such information. Hi there just wanted to give you a quick heads up. The words in your post seem to be running off the screen in Chrome. Excellent write-up. I absolutely love this site. Keep it up! I think everything said was very reasonable. However, what about this? folk’s attention? 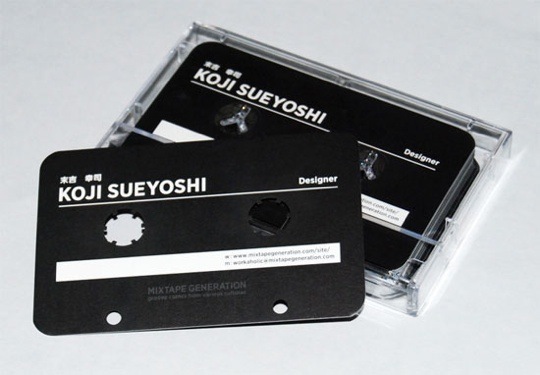 I mean Cassette Business Cards w/ Shell Holder is kinda vanilla. opinion, it might bring your website a little bit more interesting. and one to one branding to a complete new level. and clear your head before writing. I have had difficulty clearing my thoughts in getting my ideas out there. I truly do take pleasure in writing but it just seems like the first 10 to 15 minutes are usually lost simply just trying to figure out how to begin. Any recommendations or hints? What’s up, I desire to subscribe for this weblog to take hottest updates, therefore where can i do it please assist.